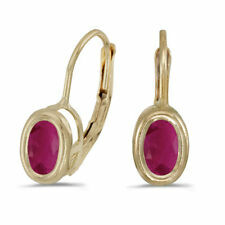 These 14k yellow gold oval ruby bezel lever-back earrings feature 6x4 mm genuine natural rubys with a 0.72 ct total weight. Topaz INFORMATION. Interesting Facts: Topaz has been credited to be effective in healing problems related to sanity, asthma, gout, blood disorders, tuberculosis and insomnia. Component Stones London Blue. 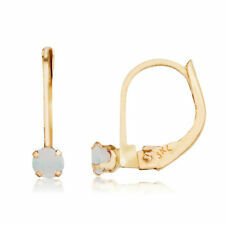 14k yellow gold lever-back earrings with petite 3 mm opal birthstones. These petite earrings are very petite, perfect for young children. October Birthdays: Opal is the birthstone for those born in the month of October. Opals are known for the stunning array of colors showcased by each stone. Unique Look: Our opal stones are genuine, natural and not enhanced, giving each a one of a kind look. No two opals look alike, so these special gemstones may not look as pictured. Madeira Citrine. Orange Red. Fifteen years ago he started the Charles Hollander Collection producing prestigious objects made out of gold and diamonds. Our quality is unsurpassed and all of our collections cater to the latest fashion trends. Shape of Gemstones = Pear. Gold =14k Yellow Gold. Color of Gemstone = Pink. Total Gram Weight Including Gemstone = 2.7 Grams. Put two different colors together to match that perfect outfit or match them up with your favorite diamond or gemstone studs, up to a 6mm hoop or our versatile interchangeable wires. WE NOW MAKE ALL OF OUR EARRING CHARMS IN SILVER, GOLD OR COPPER! These 14k yellow gold oval emerald bezel lever-back earrings feature 6x4 mm genuine natural emeralds with a 0.62 ct total weight. 14K Yellow Gold. All gold jewelry is authentic and stamped 14K. All products stamped 14k gold. Available in matching accesories (necklace, earrings, bracelet, ankle bracelet.). Best negotiable prices that you can't get anywhere else. Heart Shape. Fifteen years ago he started the Charles Hollander Collection producing prestigious objects made out of gold and diamonds. Solid 10K Yellow Gold. Rose Quartz. Our quality is unsurpassed and all of our collections cater to the latest fashion trends. 14K Yellow Gold. All gold jewelry is authentic and stamped 14K. All products stamped 14k gold. Available in white gold pink gold and yellow gold as well available with liverback & Fishhook. Available in matching accesories (necklace, earrings, bracelet, ankle bracelet.). These 14k yellow gold pear sapphire bezel lever-back earrings feature 6x4 mm genuine natural sapphires with a 0.72 ct total weight. These 14k yellow gold round emerald bezel stud earrings feature 4 mm genuine natural emeralds with a 0.38 ct total weight. 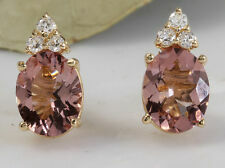 Exquisite 2.90 Carats Natur al Morganite and Diamond 14K Solid Yellow Gold Stud Earrings. Total Earrings Weight is: 2.8 grams. Total Natural Round Cut White Diamonds Weight.20 Carats (color F-G / Clarity VS2). These 14k yellow gold oval opal bezel lever-back earrings feature 6x4 mm genuine natural opals with a 0.38 ct total weight. October Birthdays: Opal is the birthstone for those born in the month of October. Opals are known for the stunning array of colors showcased by each stone. Unique Look: Our opal stones are genuine, natural and not enhanced, giving each a one of a kind look. No two opals look alike, so these special gemstones may not look as pictured. Size: 7x5mm Genuine Opals. Solid 14Kt White Gold. Also available in size 6x4mm & 8x6mm. 14Kt Stamp. These are beautiful Natural Aquamarine Studs in a Round Shape. Size: 6mm Natural Aquamarine, 2 Carats. Beautiful 5mm Aquamarine leverback earrings set in 14k Yellow gold. The perfect gift for any occasion or to add a pop of color to your personal style. March Birthdays: Aquamarine is the birthstone for March babies of all ages, with a delicately pale blue color that calls to mind images of the ocean on a clear, crisp day. Give as a Gift: Made from genuine, high quality gold and gemstones, this fine jewelry makes an excellent gift, perfect for birthdays, as a romantic anniversary gift, holiday gift, or for a special occasion. Component Stones Fifteen years ago he started the Charles Hollander Collection producing prestigious objects made out of gold and diamonds. Our quality is unsurpassed and all of our collections cater to the latest fashion trends. Size: 6x4mm Genuine Opals. Solid 14Kt Yellow Gold. Onyx INFORMATION. Our quality is unsurpassed and all of our collections cater to the latest fashion trends. Solid 14K Yellow Gold. Fifteen years ago he started the Charles Hollander Collection producing prestigious objects made out of gold and diamonds. These 14k yellow gold pear opal bezel lever-back earrings feature 6x4 mm genuine natural opals with a 0.32 ct total weight. October Birthdays: Opal is the birthstone for those born in the month of October. Opals are known for the stunning array of colors showcased by each stone. Unique Look: Our opal stones are genuine, natural and not enhanced, giving each a one of a kind look. No two opals look alike, so these special gemstones may not look as pictured. These 14k yellow gold pear white topaz bezel lever-back earrings feature 6x4 mm genuine natural white topaz gemstones with a 0.90 ct total weight. April Birthdays: White Topaz is an affordable alternative to the traditional April birthstone, the diamond. White Topaz jewelry offers a lot of sparkle and is said to help clarify your thoughts. Give as a Gift: Made from genuine, high quality gold and gemstones, this fine jewelry makes an excellent gift, perfect for birthdays, as a romantic anniversary gift, holiday gift, or for a special occasion. These 14k yellow gold pear garnet bezel lever-back earrings feature 6x4 mm genuine natural garnets with a 0.82 ct total weight. Solid 14Kt Yellow Gold. 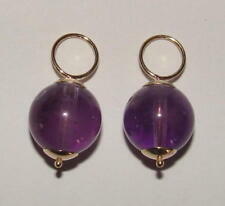 Size: 8x6mm Genuine Opals. Morganite INFORMATION. Morganite and Topaz. topaz INFORMATION. Peach and White. Solid 14K Yellow Gold. Oval and Round. Our quality is unsurpassed and all of our collections cater to the latest fashion trends. These 14k yellow gold pear peridot bezel lever-back earrings feature 6x4 mm genuine natural peridots with a 0.76 ct total weight. August Birthdays: Peridot is the birthstone for August babies of all ages, with a vibrant green color associated with beauty and serenity. Peridot stones are unique in being the rare gemstone that comes in one color, in this case a lively, vivid lime green. Give as a Gift: Made from genuine, high quality gold and gemstones, this fine jewelry makes an excellent gift, perfect for birthdays, as a romantic anniversary gift, holiday gift, or for a special occasion. Topaz INFORMATION. Interesting Facts: Topaz has been credited to be effective in healing problems related to sanity, asthma, gout, blood disorders, tuberculosis and insomnia. Component Stones Fifteen years ago he started the Charles Hollander Collection producing prestigious objects made out of gold and diamonds. Tanzanite INFORMATION. Component Stones Healing properties of Tanzanite: The Tanzanite stone is known to help manifest desires through will and vision. It gives personal insight and power. Sources of Tanzanite: East Africa - Tanzania. Sapphire INFORMATION. Green and Canary. Interesting Facts: Ancient civilizations believed that the world was set upon an enormous sapphire, which painted the sky blue with its reflection. Fifteen years ago he started the Charles Hollander Collection producing prestigious objects made out of gold and diamonds. Quartz INFORMATION. Solid 14K Yellow Gold. Our quality is unsurpassed and all of our collections cater to the latest fashion trends. Fifteen years ago he started the Charles Hollander Collection producing prestigious objects made out of gold and diamonds. 14K Yellow Gold Garnet Stud Earrings (1.80 CT ; 6 MM Cushion Cut). The Garnet stones are Heat Treated. The Total Carat Weight of the earrings are 1.80 CT. The minimum total gemstone carat weight is 1.70 CT.
Rhodolite Garnet. Component Stones Our quality is unsurpassed and all of our collections cater to the latest fashion trends. Solid 14K Yellow Gold. Fifteen years ago he started the Charles Hollander Collection producing prestigious objects made out of gold and diamonds. 12k green and rose Black Hills Gold. Item is shown larger than actual size. This item features. During a dream, he saw a mountain stream with grapevines growing on its banks. ABOUT BLACK HILLS GOLD. Heart Shape. Fifteen years ago he started the Charles Hollander Collection producing prestigious objects made out of gold and diamonds. Solid 10K White Gold. Our quality is unsurpassed and all of our collections cater to the latest fashion trends. These 14k yellow gold oval opal bezel lever-back earrings feature 6x4 mm genuine natural opals with a 0.38 ct total weight. Topaz INFORMATION. Swiss Blue. Interesting Facts: Topaz has been credited to be effective in healing problems related to sanity, asthma, gout, blood disorders, tuberculosis and insomnia. Heart Shape. These 14k yellow gold pear sapphire and diamond earrings feature 6x4 mm genuine natural sapphires with a 1.26 ct total weight and sparkling diamond accents. September Birthdays: Sapphire is the birthstone for those born in the month of September. Sapphires traditionally have a brilliant blue hue, giving them a classic look that can be worn any time of year, but they also come in more trendy, modern shades like pink. Give as a Gift: Made from genuine, high quality gold and gemstones, this fine jewelry makes an excellent gift, perfect for birthdays, as a romantic anniversary gift, holiday gift, or for a special occasion. These 14k yellow gold oval peridot bezel lever-back earrings feature 6x4 mm genuine natural peridots with a 0.80 ct total weight. 14K Yellow Gold Blue Topaz Stud Earrings (1.80 CT ; 6 MM Round Cut). The Blue Topaz stones are Heat Treated. The Total Carat Weight of the earrings are 1.80 CT. The minimum total gemstone carat weight is 1.70 CT.
Add a pop of color to your look with these elegant amethyst studs. February's birthstone, round-cut light amethyst, totaling 3/4 ct, is set in 10K gold. Pieces measure 3/16 by 3/16 inches and feature posts with friction-back back findings. 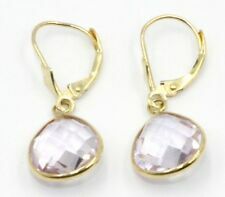 3/4 ct Round-Cut Natural Amethysts Crafted in 10K Gold Measures 3/16 x 3/16 Inches Posts with Friction-Back Back Findings . Solid 14K Yellow Gold. Fifteen years ago he started the Charles Hollander Collection producing prestigious objects made out of gold and diamonds. Component Stones Number of Diamond(s) Our quality is unsurpassed and all of our collections cater to the latest fashion trends. Sapphire INFORMATION. Interesting Facts: Ancient civilizations believed that the world was set upon an enormous sapphire, which painted the sky blue with its reflection. Fifteen years ago he started the Charles Hollander Collection producing prestigious objects made out of gold and diamonds. Mystic Topaz. Fifteen years ago he started the Charles Hollander Collection producing prestigious objects made out of gold and diamonds. Solid 14K Yellow Gold. Our quality is unsurpassed and all of our collections cater to the latest fashion trends. These 14k yellow gold oval rhodolite garnet and diamond wave earrings feature 5x3 mm genuine natural rhodolite garnets with a 0.46 ct total weight. Topaz INFORMATION. Swiss Blue. Interesting Facts: Topaz has been credited to be effective in healing problems related to sanity, asthma, gout, blood disorders, tuberculosis and insomnia. Fifteen years ago he started the Charles Hollander Collection producing prestigious objects made out of gold and diamonds. 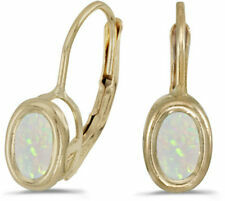 14k Yellow Gold Oval Opal And Diamond Wave Earrings. 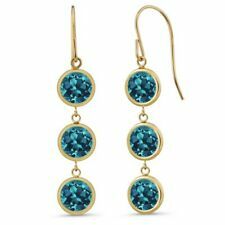 14K Yellow Gold Swiss Blue Topaz Earrings - 1.30 ct.